Today, email management is not only a filing and storage challenge. Because law firms and attorneys must be equipped to take control of litigation, email authenticity must be unquestionable with strong chains of custody, constant availability, and tamper-proof security. 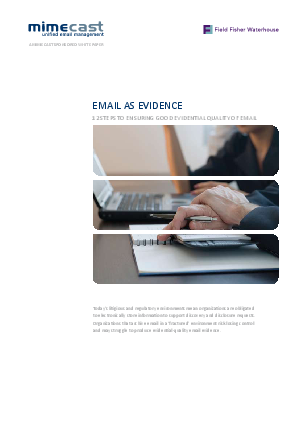 With the emergence of emails as evidence in the courtroom, it now places an urgent priority for every law firm to have auditable evidence-trails. This white paper summarizes the author's experiences of litigating in fractured environments, particularly as they pertain to email. Learn the 12 steps that will help you gain control of your electronically stored data.